The Oilholic woke up to the sad news that Total CEO and Chairman Christophe de Margerie had been killed in a plane crash at Moscow’s Vnukovo airport. This tragedy has robbed the wider oil & gas fraternity of arguably its most colourful stalwart. Held in high regard by the industry, de Margerie had been the CEO of Total since 2007, later assuming both Chairman and CEO roles in 2010. Instantly recognisable by his trademark thick moustache, de Margerie increased the focus of Europe’s third-largest oil and gas company on its proven reserves ratio like never before. He joined Total in 1974 straight after graduating from the Ecole Superieure de Commerce in Paris and spent his entire professional life at the company. Rising through the ranks to the top of the corporate ladder, de Margerie was instrumental in taking Total into markets the company hadn’t tested and to technologies it hadn’t adopted before. Wider efforts to improve Total’s access to the global hydrocarbon pool often saw de Margerie take actions frowned upon by some if not all. For instance, Total went prospecting in Burma and Iran in the face of US sanctions. France has a moratorium on shale oil & gas drilling, but de Margerie recently saw it fit to get Total involved in UK's shale gas exploration. Over the last decade, as this blogger witnessed Total ink deals which could be subjectively described by many as good, bad or ugly, one found many who disagreed with de Margerie, but few who disliked him. Even in the face of controversy, the man nicknamed “Big Moustache” always kept his cool and more importantly a sense of humour. Each new deal or the conquering of a corporate frontier saw de Margerie raise a spot of Scotch to celebrate. That’s some tipple of choice when it came to a celebration given he was the grandson of Pierre Taittinger, the founder of Taittinger champagne. 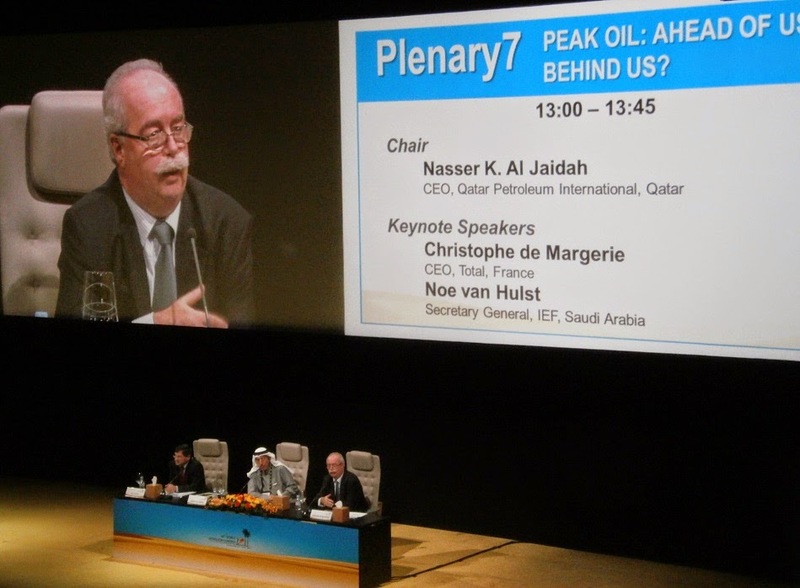 The Oilholic’s only direct interaction with the man himself, in December 2011 at the 20th World Petroleum Congress (20th WPC) in Doha, was indeed a memorable one. Jostling for position while the Total CEO was coming down from a podium, this blogger inquired if there was time for one question. To which the man himself said one could ask three provided they could all be squeezed into the time he had between the auditorium and VIP elevator! In a brief exchange that followed, de Margerie expressed the opinion that exploration and production (E&P) companies would find it imperative to venture into "geologically challenging and geopolitically difficult" hydrocarbon prospects. “All the easy to extract oil & gas is largely already onstream. We’re at a stage where the next round of E&P would be much more costly,” he added. One could have gone on for hours, but alas a few minutes is all what Qatari security would permit. Earlier at the auditorium he was leaving from, de Margerie had participated in deliberations on Peak Oil, a subject of interest on which he often “updated” his viewpoint (photo above left). “There will be sufficient oil & gas and energy as a whole to cover global demand…Even using pessimistic assumptions, I cannot see how energy demand will grow less than 25% in twenty years time. Today we have roughly the oil equivalent of 260 million barrels per day (bpd) in total energy production, and our expectation for 2030 is 325 million bpd,” he said. De Margerie forecast that fossil fuels will continue to make up 76% of the energy supply by 2050. “We have plenty of resources, the problem is how to extract the resources in an acceptable manner, being accepted by people, because today a lot of things are not acceptable,” the late Total CEO quipped. He concluded by saying that if unconventional sources of oil, including heavy oil and oil shale, were to be exploited, there will be sufficient oil to meet current consumption for up to 100 years, and for gas up to 135 years. What he astutely observed at the 20th WPC does broadly stack-up today. In wake of sanctions on Russia following the Ukrainian standoff, de Margerie called for channels of dialogue to remain open between the wider world and country’s energy sector. Total is a major shareholder in Russian gas producer Novatek, something which De Margerie was always comfortable with. He ignored calls for a boycott of industry events in Russia, turning up at both the St Petersburg forum in May and the 21st World Petroleum Congress in Moscow in June this year. However, the shooting down of Malaysian Airlines MH17 over eastern Ukraine in July prompted him to suspend buying more shares in Novatek. That cast a shadow over Total’s participation in Yamal LNG along with Novatek and CNPC. Nonetheless, de Margerie was bullish about boosting production in Russia. According to Vedomosti newspaper, he was in town on Monday to meet Russian Prime Minister Dmitry Medvedev and discuss the climate for foreign direct investment in the energy sector. As events conspired, it turned out to be the last of his many audiences with dignitaries and heads of capital, state and industry. Later that foggy Monday evening, the private jet carrying de Margerie from Vnukovo airport collided with a snow plough and crashed, killing all on-board including him and three members of the crew. Confirming the news, a shocked Total was left scrambling to name a successor or at least an interim head to replace de Margerie. In a statement, the company said: “Total’s employees are deeply appreciative of the support and sympathy received, both in France and in the many countries where Christophe de Margerie was admired and respected. In a corporate sense, Total will move on but French commerce and the oil & gas business would be intellectually poorer in wake of de Margerie’s death. His forthright views sparked debates, his stewardship of France’s largest company inspired confidence, his commanding presence at market briefings made them more sought after and his sense of humour lit up forums. But above all, in the Oilholic’s 17 years as a scribe, one has never met a more down-to-earth industry head. Rest in peace sir, you will be sorely missed. © Gaurav Sharma 2014. Photo: The late Christophe de Margerie, former CEO and Chairman of Total, addresses the 20th World Petroleum Congress, Doha, Qatar, December 2011 © Gaurav Sharma.